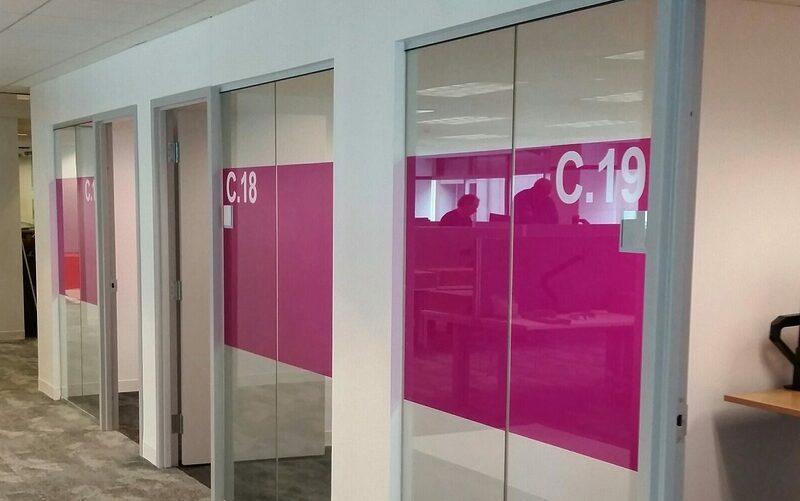 This client wanted to add some privacy to their internal offices while also giving the office a fresh new look utilizing decorative glass films. This is a great choice in any office space as the options are nearly limitless, it utilizes your existing glass and it is completely reversible if you ever decide you want a change. For this client we used a custom option of laminating a colored film with a frost film applied to the inside surface of the glass. This gives the color the client wanted, but also the privacy so people cannot look through the panel where the film is applied. We finished it off by applying the room numbers to the outside surface of the glass utilizing a white decorative vinyl. Check out some pictures of the final result below. We think you will agree that it gives the offices added privacy along with improving the overall office decor. If you have any questions about decorative glass films, click HERE and call us at (609) 801-9200 or email us at info@precisionglasstintnj.com. We would be happy to answer any questions and give you a no cost assessment and estimate on adding these films to your next project.